Professor Khellil Sefiane initiated a project with his colleagues at Northumbria University to develop an innovative concept to harvest energy from carbon dioxide for generating power using the Leidenfrost phenomenon. The project has led to the development of an engine which produces AC electricity using dry ice levitating on hot surfaces. This is hailed as a breakthrough in energy harvesting which brings space exploration a step closer. 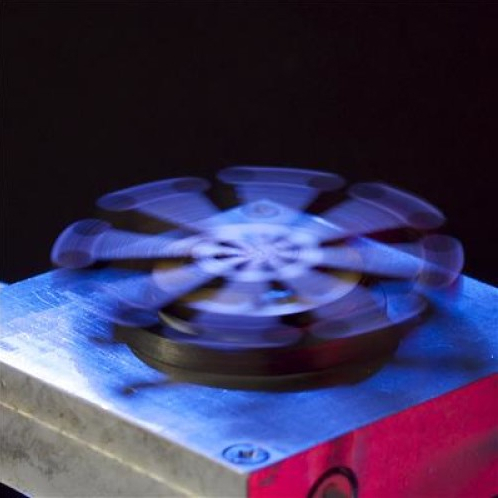 The research proposes a new kind of engine for producing energy based on the Leidenfrost effect – a phenomenon which happens when a liquid comes into near contact with a surface much hotter than its boiling point. This effect is commonly seen in the way water appears to skitter across the surface of a hot pan, but it also applies to solid carbon dioxide, commonly known as dry ice. Blocks of dry ice are able to levitate above hot surfaces protected by a barrier of evaporated gas vapour. The research proposes using the vapour created by this effect to power an engine. This is the first time the Leidenfrost effect has been adapted as a way of harvesting energy.